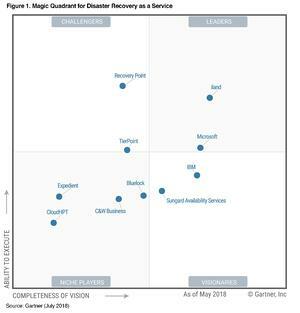 CloudHPT, the in region cloud of BIOS Middle East is pleased to announce, that it has been named by Gartner Inc. in the 2018 "Magic Quadrant for Disaster Recovery as a Service" for the second year in a row. In the report, Gartner estimates DRaaS to currently be a $2.40 billion worldwide business that is expected to reach $3.73 billion by 2021. The report recommends, "Infrastructure and operations leaders should use this Magic Quadrant to help evaluate providers of DRaaS." Gartner noted that our Assured Recovery Service was one of the only managed service offerings that could meet the needs of clients who needed in-country DRaaS for the UAE and KSA with the options for out of region DRaaS leveraging Azure and AWS. A second important point Gartner raised was "The vendor has a strong focus on Disaster avoidance through proactive security information and event management SIEM) capabilities". 1. Remote monitoring and management of networks and workloads to reduce the possibility of a disaster by leveraging our BIOS Assured Service to keep workloads healthy and to know the instant they are not allowing us to proactively address potential issues. 2. To secure these workloads via BIOS Secured, our expansive Security Incident and Event Monitoring (SIEM) solution, continuous vulnerability scanning and our SOC Services to avoid disasters caused by ever increasing security threats and incidents. 3. To provide the customer with a blended SLA using industry-leading/ the best technologies for service replication and recovery which we monitor 24x7 via our in-house NOC and regular testing. We are delighted/happy that this approach has once again been noticed and appreciated by Gartner"